Google said on Wednesday that there are now 900 million Android devices out there. There were 100 million activations in 2011, and 400 million as of 2012. But, as Pichai notes, there are seven billion people on the planet. The company’s goal is to start reaching the next several billion people who have never had access to the Internet — a goal Eric Schmidt talked about recently during his appearance at D: Dive Into Mobile. On the app side, Google’s Hugo Barra said the company has paid out as much to developers in the first four months of 2013 as it did for all of 2012. In its first announcements of the show, Google launched a pair of new location tools that developers can use to include Google’s mapping services into their apps. Of particular note is a new low-power tool that Barra said will use less than 1 percent of battery life per hour. That’s important because location-aware apps tend to be big battery drains. In addition, Google said it would support developers including geo-fencing, as well as the ability to use a phone’s accelerometer to recognize if someone is walking, cycling or driving. Google also announced a series of new services targeted at game developers, including the ability to save one’s game state to the cloud and to create multiplayer games. 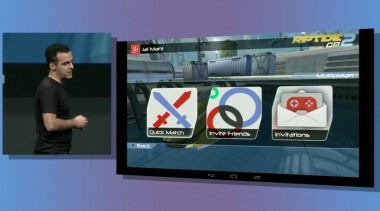 Google also announced support for achievements and leaderboards (a la Xbox Live and the iOS Game Center). Google’s game services will work across both iOS and Android. Additionally, Google is updating the tools that Android developers use to make their apps and the console used to market and sell the programs. Among the features are a means to gauge effectiveness of advertising by tracking referrals, as well as for developers to purchase professional translations to quickly get their apps into more languages. And, in stark contrast to Apple’s approach with iOS, Google is adding support for developers to do public beta testing of their apps and to deploy updates in stages to various percentages of their users. The company is also upgrading its Google Cloud Messaging service to support an always-on connection between a developer’s servers and Google’s data center, and adding the ability to send messaging back to servers from an app. Also, when a notification is dismissed on, say, a phone, it will go away on one’s tablet, too.